Trying to predict the winners of any given awards show is an inexact science, and that’s particularly true of the Emmys. While slightly more than 7,000 people decided this year’s Oscar winners, the TV Academy’s membership rolls have swollen to more than 23,000 potential voting members, up sharply from an estimated 16,000 to 19,000 just two years ago. There are also no fewer than 30 different “peer groups” which help determine various races, ranging from actors and animators to PR people and, yes, even TV executives. The same folks who determine which shows live or die also get a say in choosing Emmy winners and losers. So Vulture decided to find out what they’re thinking about this year’s key races, and how their opinions compare with the conventional wisdom of this year’s TV awards season. Their responses may not help you win your office Emmy pool, but they do offer a fascinating peek inside the minds of TV’s creative gatekeepers. Do we really have to pick between Philip Jennings and Randall Pearson? 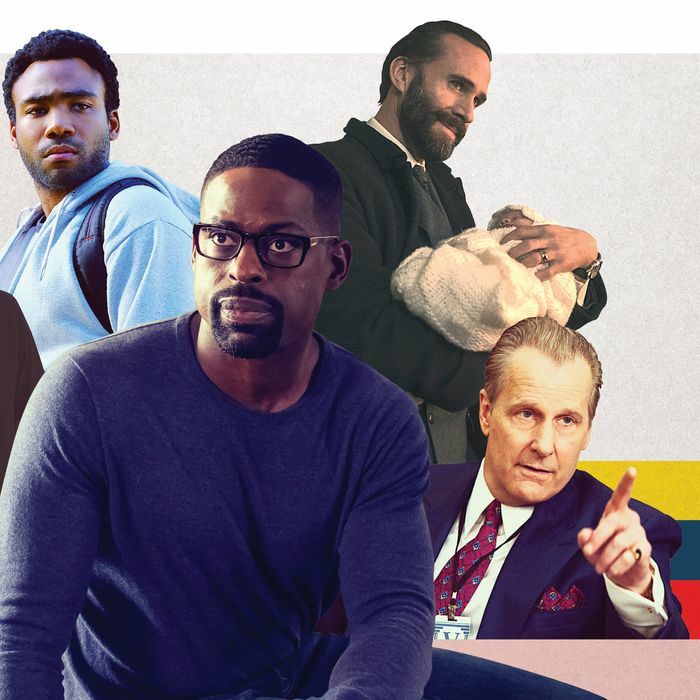 In one of the closest Emmy races of the year, the gap between last year’s winner Sterling K. Brown and three-time nominee Matthew Rhys is closing. “No one did deeper or more thoughtful work on television this year than Matthew Rhys,” says one exec. “The tragedy of his doomed friendship with Noah Emmerich was memorably potent. Every decision he made felt like it was wrenched out of his spine.” Another admired “the stillness in [Rhys’s] performance,” while a third noted that it’s the last time to recognize his singular achievements on the ’80s spy drama. But those who choose Brown for a second consecutive win admire how he manages to stand out in the Peak TV era: “He is beauty on whichever screen he shows up on,” one executive said. “He only gets better every season, and in a world of 500 scripted shows, he’s a standout,” said another. Emmy prognosticators seem to think this category will come down to a battle between Versace’s Darren Criss and Patrick Melrose’s Benedict Cumberbatch, and both actors have support from our exec panel. “It was a total breakout performance for Darren Criss,” one voter said. “The Aimee Mann scene in the bar, and what happened after, really stuck with me for a few days.” Another exec said that while she thinks Criss will win, she’s voting for Cumberbatch: “Benedict took on a role that could be so easily botched and he did a superb job.” But our voters were also equally enthusiastic about the job Jesse Plemons did in his Black Mirror episode, “USS Callister,” even if they acknowledge the Emmy odds are stacked against him. “I don’t think he has a shot of winning, but his portrait of an unexpected tech mouse turned starship tyrant was both incredibly watchable and kept revealing layer after layer,” one voter said. * For this survey, Vuture offered anonymity to panelists. Our group of ten decision-makers then agreed to be completely candid about their picks in 16 different races, revealing not just who they thought should win but why. Without getting specific about the identities of the participants, we chose TV execs from diverse backgrounds and a cross-section of programming outlets and studios. Also worth noting: While TV execs are able to cast ballots for the big series competitions, they don’t get an official say in performance categories such as writing, acting, or choreography.